The snow/woods/woodpeckers linocut is SO CLOSE to being finished, but unfortunately Monday's ink was still too wet to print the last bits on Tuesday. One day. That's all I need to finish it, one day! It's very hard to be patient. 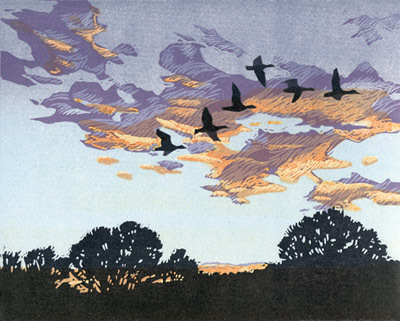 I've pulled the drying rack in front of the fire in the sitting room to try to speed things along a bit, so while we're waiting I thought we'd take a look at another favorite from linocuts past. You probably recognize at least a portion of this image, since it's the background of the header here at Brush and Baren. I could have called this the second print I made after I got Presston, my Takach etching press, except that my first run at this concept was a disaster and I scrapped the entire edition. I was still getting used to working with the press, and I had problems with pressure setting, bad color choices, and fumbling attempts at masking. You know... it was one of those @#$% "learning experiences" that people get so excited about. The end result was that the prints were sub-standard and they went into the scrap pile. I walked away from the image, and didn't revisit it until a year later. I still liked the concept, and after a year had gone by I felt a little more confident in my press technique. I'm glad I tried again. In my mind the title "Homeward Bound" has always been deliberately ambiguous. Is it sunset and are these geese going back to a lake or pond for the night? Maybe it's migration and they're headed to breeding or wintering habitat.